The formula for great hip hop has always been simple: dope rhymes and dope beats. The intangibles such as flow, cadence and confidence must also be incorporated. However,many rappers have struggled to achieve this, particularly in the last decade. With North Carolina MC Rapsody’s latest project, the ten track EP titled Beauty And The Beast, she proves she has mastered this formula. I’m always a little leary when a favorite MC of mines drops a new project. The goal should be to maintain consistency while constantly improving. In some cases, rappers will go to the left in an attempt to be versatile and totally miss the mark. This is far from the case with this joint. From the moment the opening track “Feel It” drops,you know this woman and her production team isn’t playing any games. 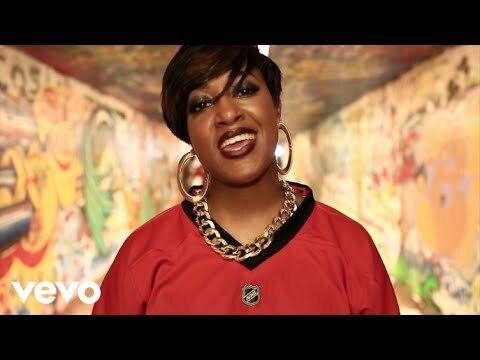 Backed by the ultra-talented Jamla team of producers (9th Wonder, Khrysis, Eric G. and newest member Nottz), Rapsody straight goes for hers, dropping lethal bars non-stop with a flow so smooth and effortless that it’s clear this is what she was born to do. One thing I’ve noticed about her on this release and her prior mixtape effort “She Got Game” is her continued progression from her earlier works. She’s always been nice lyrically but her bars are more focused and you can hear the confidence she exudes on every track. The first single “Hard To Choose” produced by 9th Wonder is an excellent commentary on proverbial crossroads all rappers face at some point in there development, whether to do it for the charts or for the love of the culture. She states “it’ll be cool to have money like Wayne” but instead sticks to her guns “choosing to respect what was built by Kool (Herc) and Bam (baata)“. You gotta respect that. The quality of the music never lets up throughout this EP, which even though is only ten tracks deep, plays like a full album (remember, Illmatic had the same number of tracks and one was the intro). This is a full plate complete with braggadocious bangers such as Drama and the reggae flavored Godzilla (I’ve always loved these type of tracks) to thought provoking tracks The Man and Forgive Me. Rapsody touches on everything from the Micheal Brown shooting to B.E.T.’s non acknowledgement of artists such as herself to the recent death of comedian Robin Williams. She maintains a perfect balance between social commentary and fire bars that establish her as one of the nicest MC’s in the game right now. The production on these tracks feel fresh as the Jamla team continues to prove that they are arguably the best production collective in hip hop right now. This is one of those joints that just gives you that feeling hip hop is supposed to give you. Now, when I do these album reviews, I try to remain unbiased so if there are any flaws in the project I will point them out. In all honesty, I could find no flaws in this E.P. This is clearly her best work to date as she’s hitting on all cylinders with this one. Anytime an M.C. rhymes like they’re gunning for the throne and the beats are on par with that philosophy, that’s what I call great hip hop. I definitely recommend this E.P for anyone that still loves quality hip hop.